Enjoy this unmistakable Viennese sound! The Vienna Mozart Orchestra have had long-standing concert practice which distinguishes them as one of the most experienced Mozart interpreters of our time. The costumes and wigs worn by he musicians at the Vienna Mozart Concerts are valuable reproductions of formal dress from the time of Mozart. The composition of the program shows the musical exercise of "Musical academies" from the late 18th century. Single movements from symphonies or solo concerts are performed together with best known and popular arias and duets. 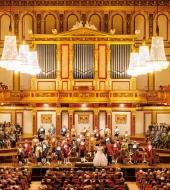 The halls of the Vienna Mozart Concerts are the very musical landmarks of Vienna and belong to the most prominent musical addresses of the world.